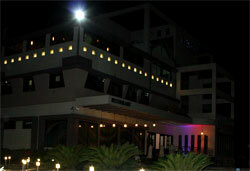 Aroma Hotel has four multi-cuisine restaurants offering wide range of tasty food and drinks. 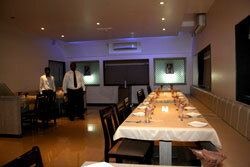 All the restaurants at Aroma are popular among food lovers at Latur. Apart from the four multi-cuisine restaurants, two independent private dining halls are available : Royal Dining hall for 8 persons and Imperial Dining hall for 20 persons. 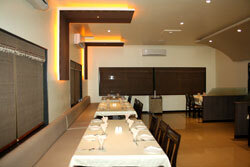 Finger Tips is a top of the class multi-cuisine restaurant situated on ground floor. At Finger Tips, we serve a wide range of dishes from chinese, punjabi, continentel and other Indian dishes and deserts. World Apart is another restaurant which offers a unique experience in dining with a variety of dishes and deserts. 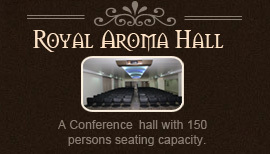 All restaurants at Aroma Hotel are equipped with super cooled air conditioning. 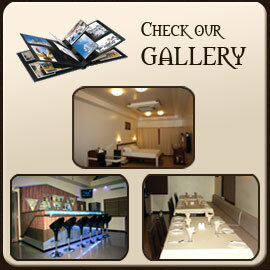 Neat atmosphere, cool ambience and tasty food are the specialities of all our restaurants. Bottom's Up Bar at Hotel Aroma, is undoubtedly the best bar in the city offering a wide range of wine and cocktails. 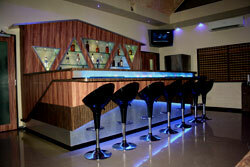 The Ambience at Bottom's Up bar is at par with star hotels. Bottom's Up is a perfect place to spend your evening with drinks. Sky Dining is an open to sky terrace restaurant with beautiful ambience for people who like to dine in the company of nature and stars. For more details or booking special parties kindly use the contact us form on the website to get in touch with us.